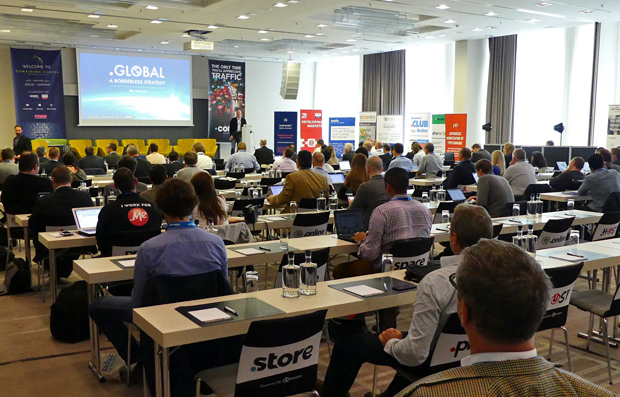 After getting underway with an afternoon of social networking on land and water Sunday, attendees at the 2017 Domaining Europe conference got down to business today at the Steigenberger Hotel Am Kanzleramt in Berlin, Germany. 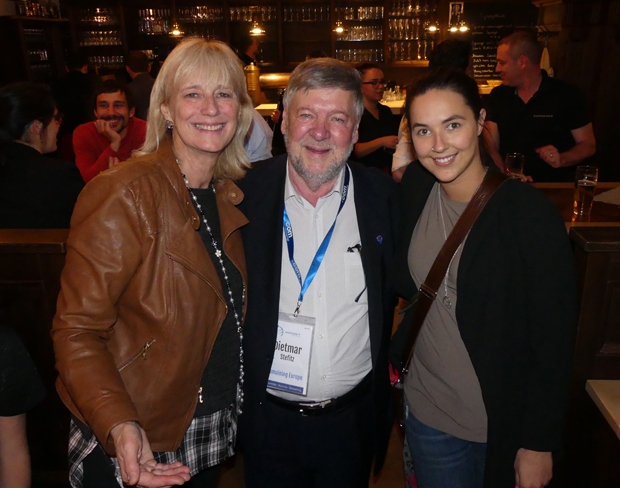 The day was packed with a dozen talks and panel discussions before being capped with the official show dinner party at the Zollpackhof Restaurant Monday evening. Above: Show moderators Braden Pollock and Jothan Frakes (standing at right) got the ball rolling by introducing Nidoma.com's Shaun Wilkinson (at podium) who is also a patron of Domaining Europe's selected charity this year - the Hope Children's Centre in Kenya. Shaun screened a film that detailed the Centre's great work in providing schooling for local children that previously had no educational opportunities. Proceeds from the conference's Undeveloped.com auction tomorrow night will go to the Children's Centre. 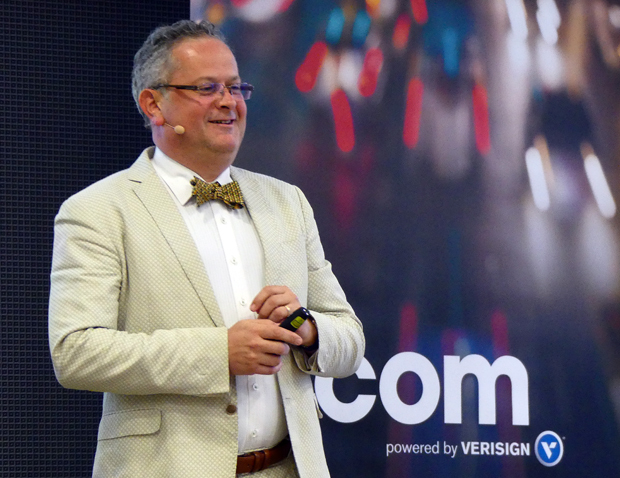 Above: Verisign Data Scientist Andrew Simpson delivered the show's first keynote at 9am, providing a treasure trove of useful data on the kind of domains that new registrants and aftermarket buyers most frequently purchase. Above: Part of the audience on the first business day at Domaining Europe in Berlin today. 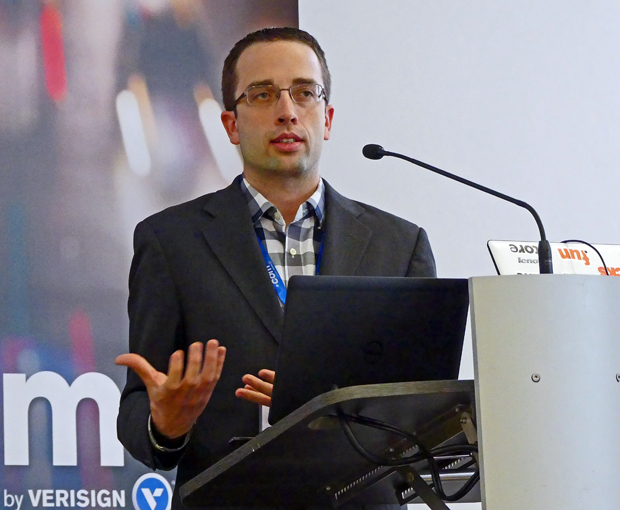 Below: The morning session continued with a talk from .Global Founder Rolf Larsen on "What a Domain Registry Can Do for Domain Investors." .Global has made a concerted effort to provide tools and information geared to attract more investors. 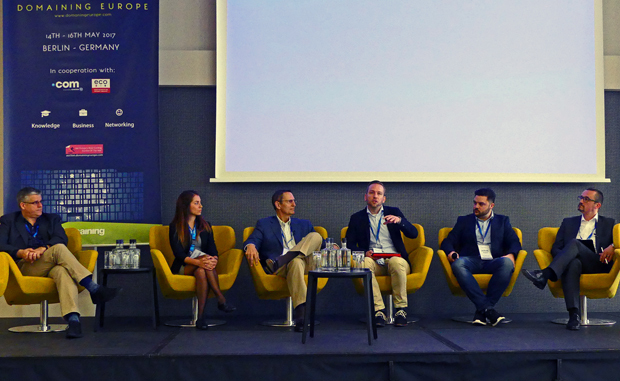 Above: In the conference's first panel discussion I had the opportunity to join five colleagues on the stage for an overview of the current state of the domain industry. Left to right are Michael Gilmour (ParkLogic), Ana Paula Vazquez (Sedo), Ron Jackson (DNJournal.com), moderator Lars Steffen (ECO.de), Jackson Elsegood (Escrow.com) and Thomas Rickert (ECO.de). 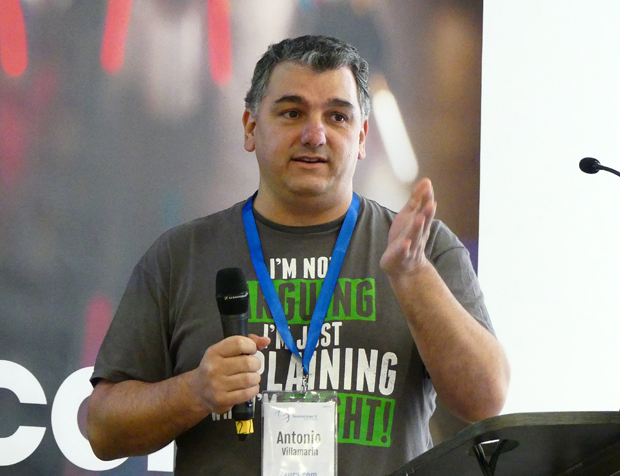 Below: In the next session, veteran domain investor Antonio Villamarin talked about his platform for putting the "Buying and Selling of Keyword Domains on Autopilot". 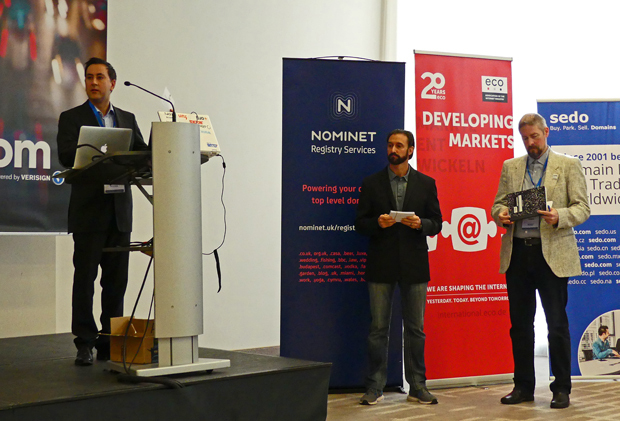 Above: Domaining Europe attendees taking notes and multi-tasking during today's business sessions in Berlin. 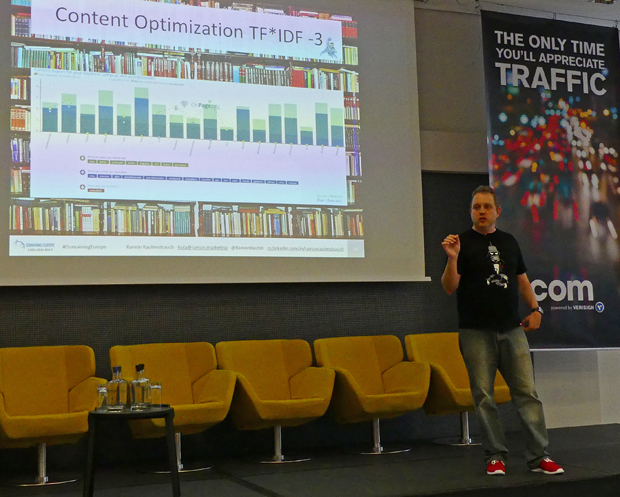 Below: At 12 noon GoDaddy's Aftermarket Product Manager Joe Styler gave attendees the latest news from the domain aftermarket. 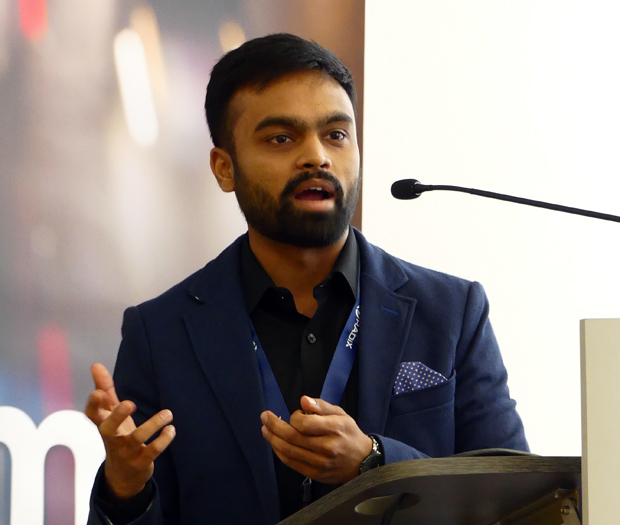 Above: In the final session before the Monday lunch break, Radix Registry's Karn Jajoo provided data to back up his special presentation - "Busting 10 Myths About New Domain Extensions." 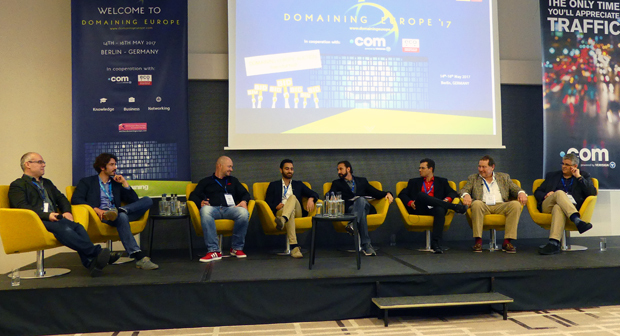 Below: In the first panel discussion after lunch the prospects for gTLDs, Geo TLDs and ccTLDs were covered in depth. 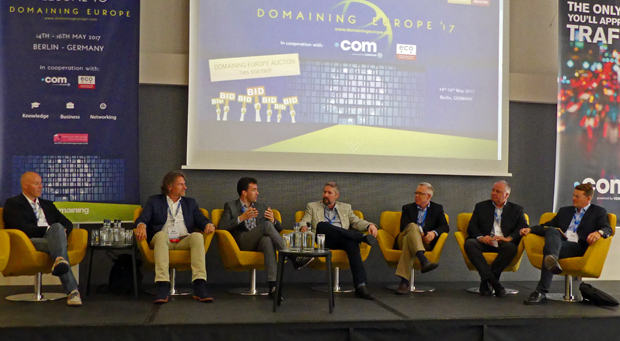 The panelists, left to right, were Rolf Larsen (.GLOBAL), Dirk Krischenowski (CEO, .Berlin), Michiel Henneke (SIDN and .Amsterdam), moderator Jothan Frakes, Rob Monster (Epik.com), Richard Wein (Nic.at) and Dr. Jorg Schweiger (CEO, DENIC). 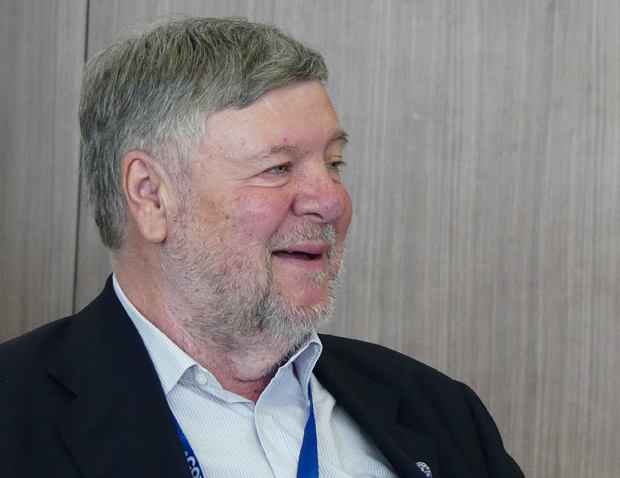 Above: Domaining Europe Founder Dietmar Stefitz enjoying the afternoon business sessions today in Berlin. 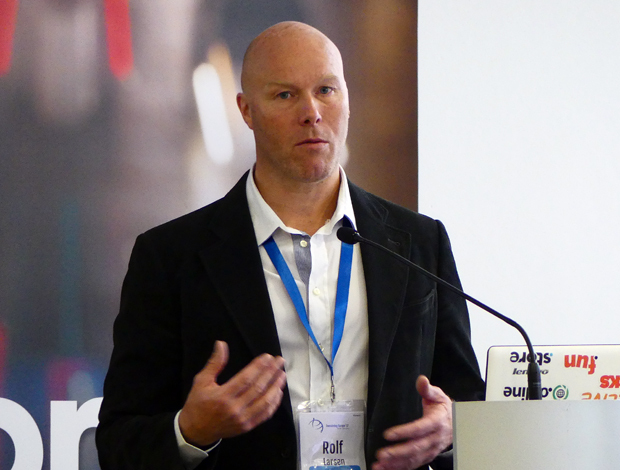 Below: A 3pm panel discussion featured advice from leading domain investors and brokers. 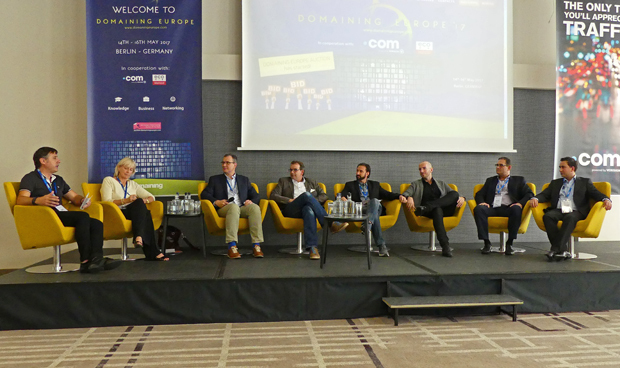 The panelists, from left to right, were Jordi Gasull (NameAgency.com), Ilze Kaulins-Plaskacz (ExcellentDomains,ca), Freddy Schiwek, Marc Stepken (Sedo), moderator Braden Pollock, Giuseppe Graziano (GGRG.com), Sevan Derderian (Above.com) and Shaun Wilkinson (Nidoma.com). 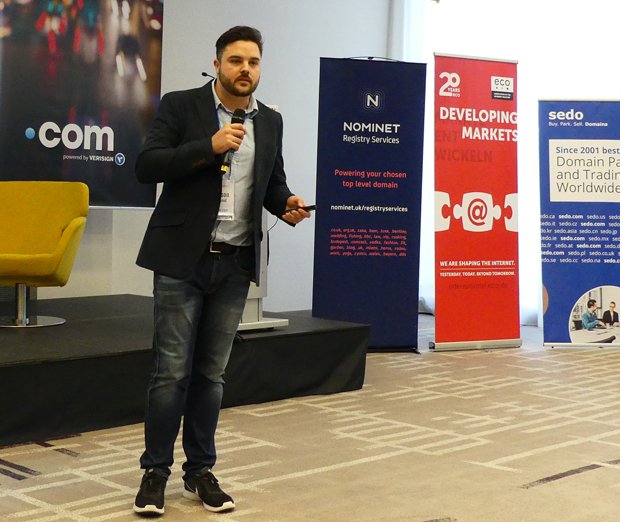 Above: After the 4pm coffee break, Ramon Rautenstrauch (Divulga.Media) provided advice on "How to Make Money with Keyword Domains." Below: The day's final panel discussion followed at 5pm with the eight experts on the dais dissecting the ins and out of Traffic, Parking and Development. There were, left to right, James Tuplin (Bodis.com), Andreas Schmid (Product Manager at Sedo), Axel Kaltz (ParkingCrew.com), Reza Sardeha (Undeveloped.com), moderator Braden Pollock, David Warmuz, Dave Roberts and Michael Gilmour. a primer on domain leasing and the tools Escrow.com offers to make leasing easy. 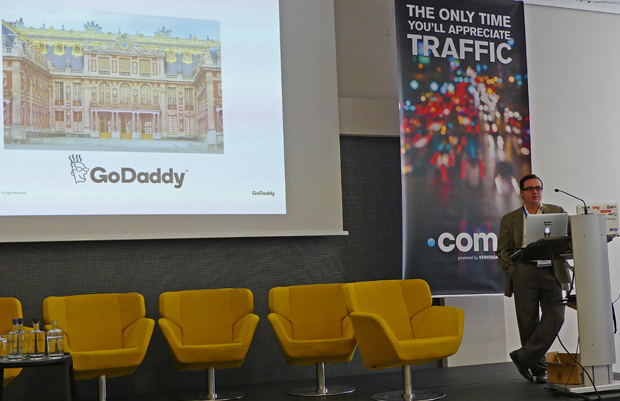 Below: Yancy Naughton (HasTraffic.com) closed out the first day of business with some advice on how to choose your partners well for supply or demand before developing or monetizing a domain. 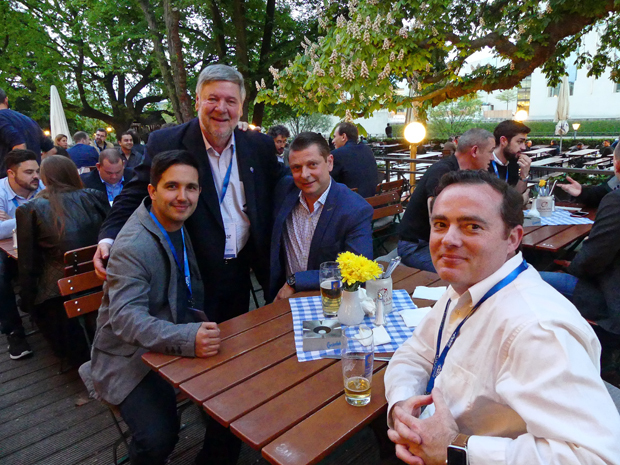 While the business day was over the night was just beginning thanks to the official Domaining Europe dinner party held at the beautiful Zollpackhof Restaurant and Biergarten, just a couple of blocks away from the show hotel. tonight's dinner party at the Zollpackhof Restaurant and Biergarten in Berlin. going back and forth to mingle with friends and new acquaintances. 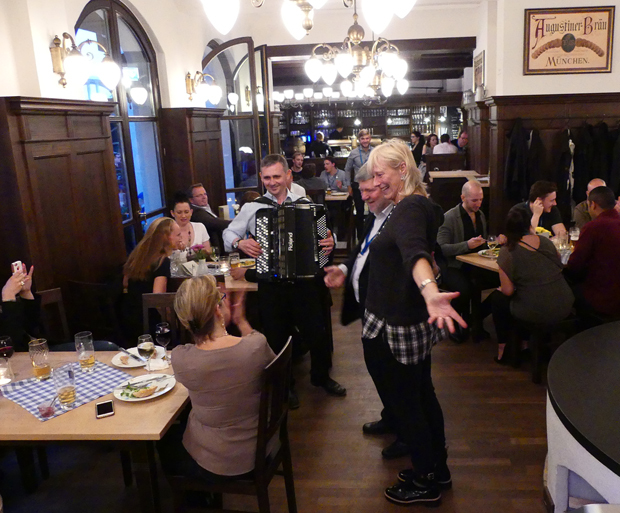 Above: Ilze Kaulins-Plascakz (from Canada-based ExcellentDomains.ca) and Domaining Europe Founder Dietmar Stefitz get a round of applause after performing an impromptu dance accompanied by the biergarten's accordion player. Below: Ilze brought her lovely daughter Natasha (at right) to Domaining Europe. As the party finally began winding down they searched out Dietmar to thank him for an unforgettable night in Berlin. Domaining Europe 2017 concludes with a second full day of business Tuesday (May 16) that will get underway at 9am. I will have all of the Tuesday photos and highlights for you in my next post from Berlin tomorrow night.